May 2018 Design&Reuse SoC News Alert. Two weeks in a row the Comsis IoT 802.11ah HaLow IP is the most consulted. 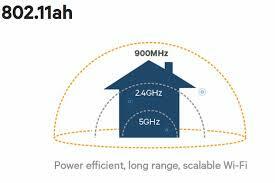 IEEE 802.11ah is a wireless IoT networking protocol also called Wi-Fi HaLow. Developed and implemented by Comsis the IP addresses all industrial IoT markets including M2M markets. It uses 900 MHz unlicensed bands to provide extended range Wi-Fi networks up to 1,5km compared to conventional Wi-Fi networks operating in the 2.4 GHz and 5 GHz bands. It also benefits from lower energy consumption, allowing the creation of large groups of stations or sensors that cooperate to share signals, supporting the concept of the Internet of Things (IoT). The protocol is intended to be extensively deployed with its low power consumption, its wider coverage range. This is accomplished by a combination of enhanced MAC and PHY implementations including reduced contention, Power saving mode, sectorization with advanced signal processing techniques to cope with new IoT use cases. The 802.11ah IoT protocol will see early widescale applications for a large number of use cases in Industry 4.0 (logistics, robotics, manufacturing,…) where others IoT cellular protocols, ie LTE M, NBIoT, will not be used because of their higher Capec/Opex and the risks attached with the theft of the Operator’s data.